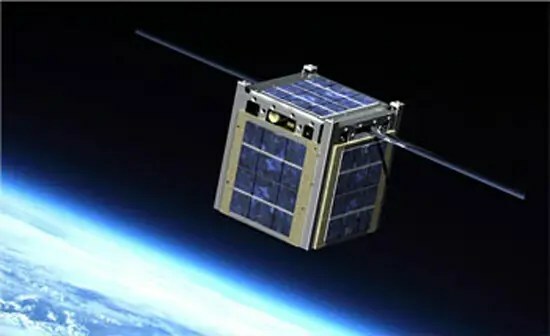 An artist’s illustration of a tiny cubesat satellite in orbit. SANTA CLARA, Calif. — The NASA Ames Research Center is known for establishing innovative partnerships and Pete Worden, the former Air Force general who serves as the Center’s director, is known as a maverick. Still, the latest joint venture to come to light has caught even some longtime NASA observers by surprise. “Only Pete Worden would do something like that,” said Bob Twiggs, who was one of the inventors of the cubesat while he was a professor at Stanford University. “He is a real independent hero to me in blazing new trails rather that sticking close to the safe road,” Twiggs, who now serves as a professor at Kentucky’s Morehead State University, said by email. A couple of weeks later, NASA Ames officials visited the prison and confirmed that inmates had access to the type of machine tools they would need to build PPODs. That led to a two year, non-reimbursable Space Act Agreement that senior officials from NASA Ames and San Quentin signed in June 2011. As part of that agreement, NASA Ames officials developed the educational plan to train inmates to build the small satellite components. The partnership program is designed primarily to help “a few select inmates develop their machining skills to make them more employable in the aerospace industry upon release,” Adriana Cardenas, NASA Ames associate director of engineering, said in an emailed response to questions. “The components will never fly in space,” said Cardenas, who also serves as NASA Ames’ liaison to San Quentin. However, PPODs manufactured in San Quentin’s machine shop will be handed over to NASA Ames and “depending on the quality, we may consider the possibility that they could be used as test articles.” Center officials have not yet made any plans to use the PPODs built at San Quentin for testing, she added. Nevertheless, Worden said the hardware produced at San Quentin has been “top notch.” In addition to providing training for the inmates, Worden said he has promised to help a couple of them find employment when they are released from prison. This entry was posted in ABUSE OF POWER and tagged NASA, Nazi, Prison Slave Labor. Bookmark the permalink.